The Larson Electronics SLEDB-5-M-100LB-WR Solar LED Strobing Beacon is powered from internal lithium ion batteries, replenished by a solar charging panel or cigarette plug charger. The beacon is equipped with a permanent mount and magnetic mount options. The amber color light output ships with a clear lens and an orange base. All other color options ship with a clear lens and a black base. 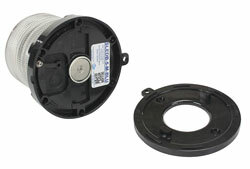 The SLEDB-5-M-100LB-WR includes a wireless remote control which can turn the fixture on or off. This wireless operation greatly increases the versatility of this beacon and allows it to be used where a power source is lacking or when the operator doesn`t want to deal with the hassle of wires. This compact rechargeable LED solar beacon contains an LED diode assembly that produces 360° of brilliant light. The effective distance of this LED strobe light is approximately 1000 feet. While we offer much brighter LED strobing beacons, our design goal here was to produce a beacon with reasonable light output that could run 24 hours a day, seven days a week with 5 hours of daily sunlight. Thus we choose a 1 watt LED and sized the lithium ion batteries and solar panel to produce and store enough energy to power the beacon. Keeping in mind that this LED beacon may not be exposed to sunlight continuously, we built in a 12 volt vehicle charger option as well. The vehicle charger will bring the beacon to full charge in 2 hours. 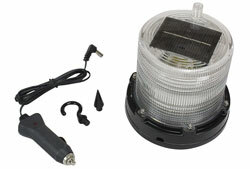 This LED strobe light includes a permanent mounting system with through holes for the mounting base. Once attached, the beacon can still be removed by twisting the beacon counter-clockwise off the base. This twist lock design allows operators to remove the light for vehicle charging if necessary. For example, if it is mounted on vehicle that is stored in a parking garage, the sunlight may be insufficient to recharge the beacon and vehicle charging may be required. However, if the strobe is mounted to a vehicle or other structure that is exposed to the sun daily, operators can add an additional screw that locks out the twist lock function. Built in to this LED beacon is a strong 100 lb magnetic base which can be used instead of the permanent mounting base options. Operators simply stick the beacon to any steel surface. This magnetic strobing LED beacon can be used on moving vehicles at highway speeds. This solar powered LED beacon is both weatherproof and shock resistant. This strobing LED assembly is protected by a polycarbonate lens cover that is designed to efficiently distribute the flash over a 360 degree radius. The color of this unit is produced by color specific LEDs rather than a colored lens. This increases the effectiveness and reliability of the unit as there is no chance of lens discoloration and no loss of output due to diminished optical clarity. This LED beacon will operate 24 hours a day with 5 hours of sunlight, making it ideal for remote applications where power is limited. The on/off button and charging port are located on the bottom of the beacon. The beacon comes with a wireless remote control that allows operators to turn the fixture on or off remotely with the ease of a button press on the remote. 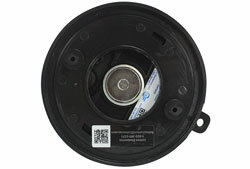 This light features a clear lens, colored LEDs, and a black base and mounting bracket. The amber color variant features a clear lens, amber LEDs, and an orange base and mounting bracket.